Watches of Knightsbridge November Auction: For a while now we’ve been highlighting timepieces up for auction from Watches of Knightsbridge. As with anything that you are building to be great, things take time but now I believe they’ve reached a place where more and more, spectacular barn finds are being unearthed making each of their auctions that much better. As per usual, a few weeks ago we spent some time over at 64 Knightsbridge to get hands-on with some of the timepieces in the upcoming November auction on Saturday the 21st. Like always, we decided to pick out a handful of timepieces and share our thoughts on them. Lot 137: There is no doubt that right now vintage Heuers are experiencing a lot of attention and as a by-product of that, they’ve also seen quite a hike in their value. 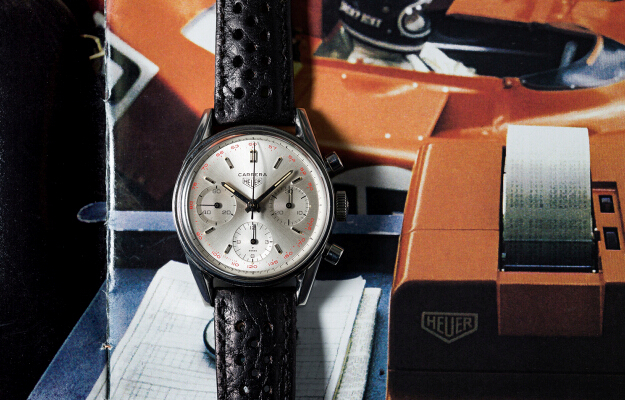 Introduced in 1963, the Carrera was the first Heuer line of Luxury wrist watches with its own brand name. While the Carrera was an evolution in terms of design for Heuer, its design was distinctive compared to the more widely seen chronographs of the 1940s and 1950s. This particular version is one of the many variations of the Carrera 2447 dial but not often do you see the silver dial iterations in this condition, as they tend to discolour, showing more signs of patina than their black dial counterparts do. This Heuer Carrera ref. 2447T, features a silver dial with baton hour makers, with three sub dial registers, recording minutes, hours and continuous seconds. As mentioned above it features a red outer tachymeter scale. This reference 2447T houses the seriously reliable and much sought after Valjoux calibre 72. However, as with all chronographs from this era, it sports a 36mm stainless steel case, which always sounds small but once on the wrist it just seems to wear bigger. In keeping with the racing theme, this one comes on a black leather racing strap. This 1960s Heuer Carrera ref. 2447T is up for auction at an estimated price of ￡4,000 – ￡4,500. Lot 199: Over the past few years Longines have re-introduced some past models, the Legend Diver, the Single Push Piece Chronograph, Heritage Diver 1967 just to name a few. Nevertheless, one that hasn’t been re-issued is this rare Nautilus Skin Diver. 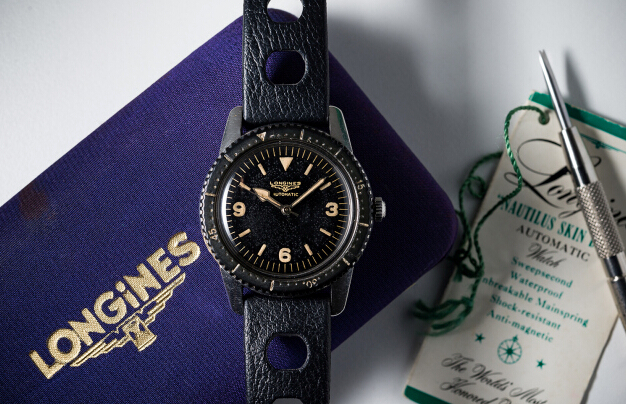 What you are looking at here is one of the earlier examples of a Longines diving wristwatch. First introduced in 1957, the Nautilus Skin Diver is probably lesser known than its predecessor the Automatic Diver. This very early example sports a 3-6-9 dial as opposed to the more common 3-6-9-12 dials. Quite remarkably, one of the weakest points of this Nautilus Skin Diver is still intact, the fragile bakelite rotating bezel, whether this has been replaced or not it hard to tell but that fact that it’s still in one piece is quite something. This Longines Nautilus Skin Diver, sports a black dial, with luminous markers, along with numerals at 3, 6 and 9 o’clock. As mentioned above the 60-minute rotating bezel is made of a material called bakelite. Inside is the Longines caliber 19AS, which is protected by a thin layer of lead and is cased in a 40mm stainless steel housing that will be fixed to the wrist via a well-weathered black tropic strap. This rare Longines Nautilus Skin Diver is up for auction at an estimated price of ￡2,500 – ￡3,000. Lot 283: Just like their predecessor, these Zenith El Primero movement Daytona’s have subtleties, such as different tachymeter scales, Patrizzi dials, to name a few but the ones that probably go more unnoticed are the “floating Cosmograph” dials. I’ve mentioned before what that means but in case you don’t know, then I shall repeat it. If you look closely at the dial you’ll notice that the wording “Cosmograph” sits well below the first four lines, which has led to collectors naming it a “floating dial”. Of course, this undoubtedly adds a price premium. This circa 1987 Daytona ref. 16520 features a black gloss dial with luminous inlaid white gold batons, silver ringed triple subsidiary dials, recording hour, minutes and continuous seconds. Inside is the El Primero based calibre 4030. The 39mm case on this particular example is in excellent condition. This Rolex Daytona “Floating Cosmograph Dial” is up for auction at an estimated price of ￡9,000 – ￡12,000. Watches are one of our favourite accessories here at The Coolector and it is always heartening to see designers out there looking to create new pieces and whilst the Miyota 9015 automatic movement isn’t something which is currently available, we hope that it eventually will be or, at the very least, inspire an established watch brand to create a similar looking automotive timepiece.